An open invitation to anyone with a passion for programming join hands and learn Ruby on Rails. We are not a finishing school, we are a world-class Ruby on Rails development company. Our Ruby to?Campus program is to identify and provide necessary skills to make you fall in love with Ruby, teach you the right software engineering techniques and the power and beauty of the Rails platform. Our first few steps into the IT world can be challenging. Especially when you have to start working from day one and are expected to show results by delivering features. Nobody will hand hold you like they did when you were in school/college. This is not likely due to not wanting to but just that everyone is in a frenzy trying to be most productive by working on features themselves. The last thing you would want is not being able to assimilate the programming language, let alone use it! Learning a programming language has a steep learning curve. You will have to face technical jargons, concepts and tough decisions on which one to choose. Programming languages fall into certain common categories like object oriented, functional etc. Which means once you learn a programming language it makes it easier to learn the others in the same category. Object oriented programming languages tops the list of most wanted languages over the last couple of years. The easiest of them being Ruby. Ruby is a general purpose programming language created in the 1990s by Yukihiro Matsumoto. This is one of the best languages you can start with when you embark on your learning adventure. Programming trends have changed over the last couple of years where high-level programming languages (close to spoken languages) have taken precedence over the low-level languages (that are similar to machine languages). This makes such languages more prominent and more likely to be picked up/learnt by new-comers. Ruby being one of them is easy to learn due to English like nature thus establishing a more productive learning process. Ruby shot up in popularity over the past couple of years due it’s easy learning curve. Moreover it is easy to bring up a full fledged working app in just a couple of minutes using the Rails framework. 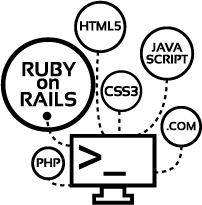 The Rails framework is based off of Ruby programming language. Ruby On Rails has an excellent community that supports Ruby-lovers and there are a lot of free online learning resources where you do not need to rely on printed books for documentation. Ruby on Rails Talent is in high demand across the world. Kick-start your career as a Rails Developer and go places. Be ready for the corporate world as you complete your degree. Students should be in their 3rd or final year of study, and can belong to any of the stream of study, but must have a passion for programming.